I made these ribs for our Easter dinner, and have been dying to share them with you. So good, and so easy! I always forget to use my crock-pot for actual cooking (I mostly use it to keep food warm), but I then I make a recipe like this and fall in love with the fix-it-and-forget-it method. It's extra perfect for holiday dinners, when you already have a million and one other dishes to prepare. Not only are they ridiculously easy, but they are so good, really, crazy good. The hours in the crockpot serve to make them fall-off-the-bone tender (I mean it! I saw it happen! ), and they are immersed in flavor. All that to say, make them. You won't regret it. Spray inside of 5-6 quart slow cooker with cooking spray. If necessary, remove inner skin from the ribs. In a bowl, mix together brown sugar, pepper, Liquid Smoke, garlic, and salt. Rub mixture onto all sides of the ribs. Cut ribs into 4 inch pieces, then layer ribs and onion in the slow-cooker. Pour Coca Cola over everything. Cover and cook on low for 8-9 hours, or until ribs are tender. Remove ribs from slow cooker, and discard liquid and onions. 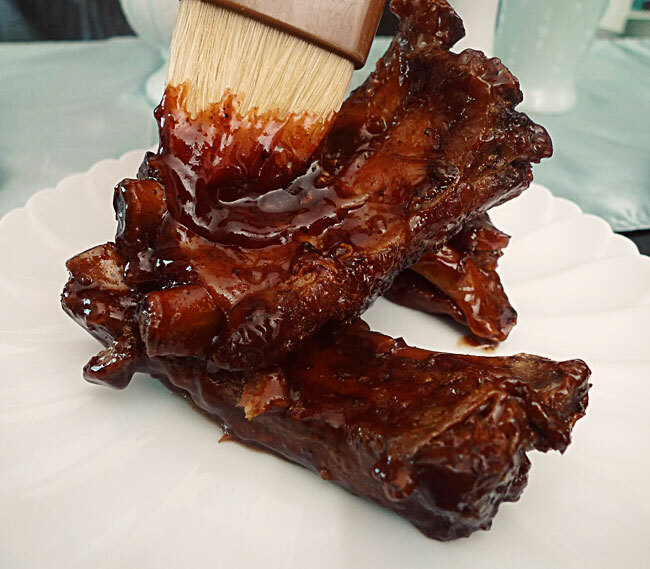 Pour BBQ sauce into a shallow bowl, and dip each of the rib pieces into the sauce. Return the ribs to the slow-cooker, and pour any remaining BBQ sauce over them. Cover and cook on low for 1 hour. Serve and enjoy! Serves 6. So good. Love the cocola.